It comes to something when a self-confessed city lover tells you – someone who has lived and breathed Cornwall for most of their life – about a place so special that it played a major part in turning a moderately successful architect’s assistant into one of this country’s best known novelists. Katharine and I have been friends since meeting as students at Bristol University nearly forty years ago. Whilst I opted for the rural lifestyle, she and her husband made London their home, both of them carving out successful careers – Martin as a headmaster and Kate as a bestselling historical fiction writer. We’ve kept in contact and, in recent years, meet up every couple of months. 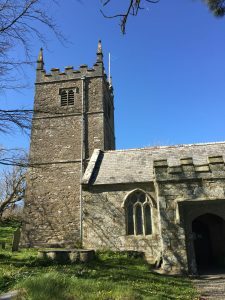 That’s how I found out about their annual pilgrimage to St Juliot Church, just north of Boscastle, and its pivotal role in Thomas Hardy’s life. It’s not a place you’re likely to stumble upon by accident as the would-be author and poet discovered in 1870. 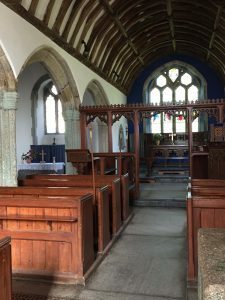 Having worked in architecture for fourteen years, he travelled down from Dorset to help restore the church from the extremely dilapidated state that it was then in. The journey on 7 March was reportedly a nightmare, involving a pre-dawn start and lots of train changes. 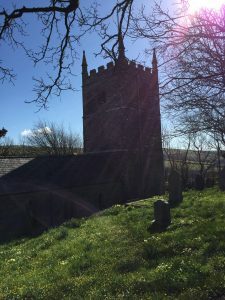 Finally reaching St Juliot’s Old Rectory in the evening, Hardy was met not by the rector who was in bed with gout, nor by his wife, Helen, who was looking after him, but by Emma Lavinia Gifford, her sister. Describing her later as the ‘young lady in brown’, the budding novelist - who had just posted the manuscript of ‘Desperate Remedies’ which was to become his first published work – was clearly smitten with the woman who had moved to St Juliot when her sister married the Reverend Caddell Holder and who sold watercolour sketches to help fund the restoration scheme. Over the next few days he spent his time ‘drawing and measuring’ in the church, whilst also getting to know Emma. By the time he returned to Dorset, he wrote that it was ‘with magic in my eyes’. Mutual attraction turned rapidly to love in a place that was transformed from ‘irremediable dilapidation’ - with a tower that, according to Emma, ‘went on cracking from year to year’ – to a much-enhanced, re-built building that was officially opened on 11 April 1872. Hardy didn’t attend that event but his visits continued. On 8 September 1872 he read the lessons at a service there and, during that stay, received a letter offering him more architectural work in London. Should he accept or take a gamble and write full-time? With Emma’s support, he refused the job and chose the latter. His next novel ‘A Pair of Blue Eyes’ drew largely on his experiences at St Juliot and, after finishing ‘Far from the Madding Crowd’, the couple married on 17 September 1874 – sadly not in the place that had brought them together but in St Peter’s Church, Paddington. They lived as man and wife in Dorset for 38 years but what seems to have begun as a romantic union of minds - underpinned by a shared appreciation of books, poetry and nature - gradually dwindled into a much less happy relationship. 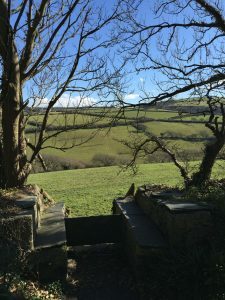 Maybe Emma felt that her own poetic aspirations were being stultified by her husband’s genius – he referred to her longing to write as a ‘painful delusion’ – or perhaps they both needed Cornwall and the beautiful backdrop of St Juliot to rediscover the feelings that its setting had inspired. She is far from now.